Houston Cotton Exchange Building, 1910. Image available on the Internet and included in accordance with Title 17 U.S.C. Section 107. Inside the Houston Cotton Exchange. Image available on the Internet and included in accordance with Title 17 U.S.C. Section 107. Houston Cotton Exchange Building. Image available on the Internet and included in accordance with Title 17 U.S.C. Section 107. HOUSTON COTTON EXCHANGE AND BOARD OF TRADE. For more than half a century the Houston Cotton Exchange and Board of Trade was a force in promoting the commercial welfare of Houston. In addition, the organization bequeathed to the city and state an important legacy in the form of the exchange's first building, an architectural and historic treasure. The Houston Board of Trade and Cotton Exchange, as it was named in 1874 in its first charter, succeeded the Houston Board of Trade, which had been established in 1867. The founders included some of Houston's influential business leaders in cotton marketing, banking, railroads, and the lumber industry. (see BANKS AND BANKING and COTTON CULTURE.) 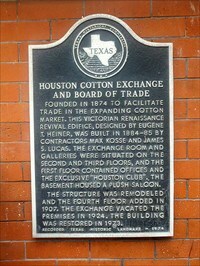 In 1877 a new charter changed the name to Houston Cotton Exchange and Board of Trade. The organization took a position of leadership in Houston's development. As early as 1885 it was lobbying the United States Congress for a deepwater channel to the Gulf of Mexico. The need for Houston to have an exchange that would systematize and regulate the trading of cotton had been growing since the birth of the industry in Texas in the 1820s. Exports from Houston surpassed 100,000 bales in 1860, and the years following the Civil War saw further growth. After the Missouri Pacific railroad system was completed in 1873, arrangements were made for the Houston exchange to use cotton quotations of the St. Louis Board of Trade. In 1885 the exchange completed construction of its three-story headquarters at Travis and Franklin streets. The building's Victorian Renaissance Revival architecture, so described by the Texas Historical Commission, was executed by Eugene T. Heiner, whose other work included a number of public structures in Southeast and Central Texas. The Cotton Exchange Building was a center for business and civic events. It was enlarged to four floors and remodeled in 1907; the present ornate trading room was installed at this time. In 1924 the exchange moved to a new, larger building at Prairie and Caroline streets. The cornerstone from the original building was moved to the lobby of the newer one. In 1973 the Travis Street building underwent a massive restoration that received national recognition. The building was one of the first in Houston to be listed on the National Register of Historic Places, and it was designated a Texas Historic Landmark by the Texas Historical Commission. The Houston Cotton Exchange and Board of Trade continued nominally for some time after the need for a cotton exchange ended. It disbanded shortly after becoming 100 years old. Benajah Harvey Carroll, Jr., ed., Standard History of Houston, Texas, from a Study of the Original Sources (Knoxville, Tennessee: Crew, 1912). WPA Writers Program, Houston (Houston: Anson Jones, 1942). Handbook of Texas Online, John Tweed Hannah, "HOUSTON COTTON EXCHANGE AND BOARD OF TRADE," accessed April 22, 2019, http://www.tshaonline.org/handbook/online/articles/drh01. Uploaded on June 15, 2010. Modified on March 21, 2017. Published by the Texas State Historical Association.